Players on each cone, remaining players line up at &apos;A&apos; with one ball each. Player at &apos;A&apos; passes ball to either player at &apos;C&apos; (alternate sides). 40 x 20 yard area. Pairs of cones to create gates - number of gates based on number of players - 3 gates per player. Free form dribbling - see progressions/regressions. When coach says &apos;yellow light&apos; or &apos;50%&apos; player dribbles at half game/full pace freeform in the zone. When coach says &apos;green light&apos; or &apos;100%&apos; player sprints/dribbles ball at full speed. Coach counts down from 20/15/10/5. P - Try to dribble without looking at ball. P - Competition - who can get through the most gates in 60 seconds. If ball touches a cone it doesn&apos;t count. If player or ball touch another player minus 3 points. P - Players in pairs, one ball per pair. 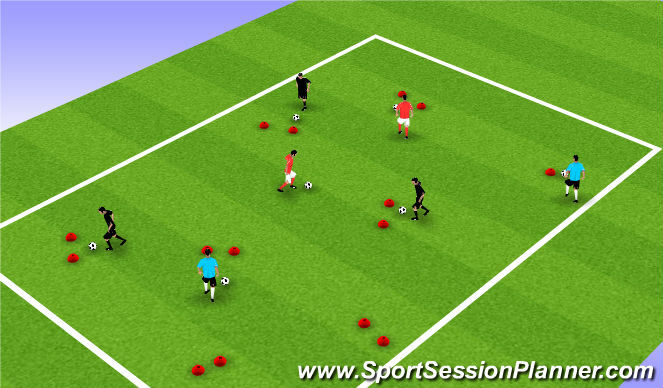 Players dribble free form in the area, maximum of 3/2/1 touches before passing to each other. P - Competition - As prior progression. Which pair can pass through the cones the most in 3/2/1 minutes. 40 x 20 yard area. 8 - 12 players in area, one ball. Each player is given a number 1 to X. Ball starts with unapposed player # 1 who passes it to player # 2 after player # 2 calls out their number ("2!"). Player # 2 passes it to player # 3 after player # 3 calls out their number ("3!") and so on. Player with highest number plays theball back to player # 1. First touch - take energy out of ball by moving foot backwards. Lift head on pass - look at target and not ball. Accuracy - to feet of stationary player, infront of moving player. Use of space/movement before/after pass. Body shape - be on toes, open body posture, ready to receive ball. Look over shoulder prior to receiving ball. P - Right foot only. P - Left foot only. P - Receive on one foot, pass on other foot. P - Add extra ball(s). P - Competition - See how many consecutive passes can be made before bad pass made. P - Competition - See how many passes can be made in 3/2/1 minutes. 20 x 20 yard area. 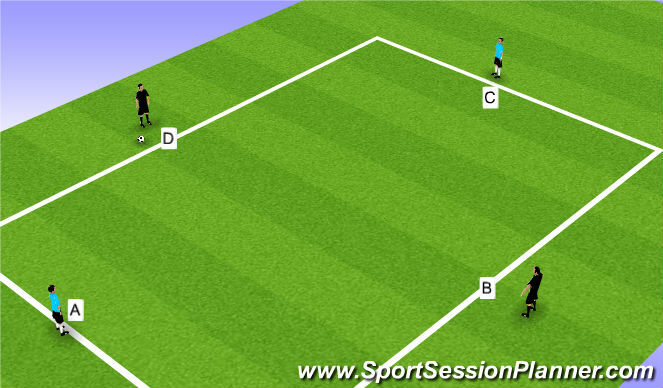 4 players on edge of area at A, B, C, D. One ball. 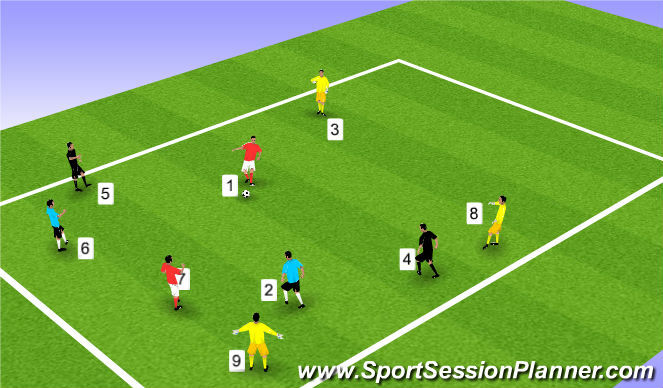 Ball starts with unopposed player at A who passes it to player at B 90 (anti-clockwise - to right foot). Player receiving ball has to move away from passer then check to ball as they touch/control it on half-turn. Players must stay outside area. Lift head - look at target and not ball as pass made. Use instep, locked ankle, toe up. P - Allow touch into area. P - Allow driven and chip passes. Four cones in square - 20 yards apart. Number of squares dependent on number of players. One player on each cone. Player with ball at A passes to player at B and follows ball. See progressions. Lift head - look at target and not ball. P - Alternate left foot, right foot. P - Add extra player(s) and extra ball. P - On receiving ball, player passes back, receiving player returns ball again..
P - Player dribbles from A to B and makes makes diagonal pass as at Y to moving player. P - Add player in middle, X, who performs wall pass to player with ball. P - Competition - see how many rotations players can make in 3/2/1 minutes. P - Increase zone (cones at E and F) and include progressions above. 4 V 4 + 2 - Adjust based on number of players. Two players from each side on lines facing team mate as shown. 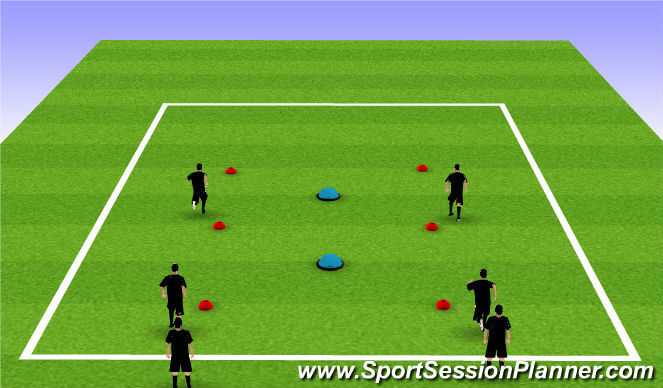 Players attempt to get ball from one side of zone to other - A to B. 1 point for each successful attempt to get ball from A to B. Rotate side/center players. Use of space - move off ball (including players on side lines), pass to space. P - Max 1/2/3 touches. P - Ball has to go wide before it can go long. P - Every player in center of zone has to touch ball 1/2/3 times. P - Add wild card player (X) who has to touch ball/be involved in play. P - Have a player from both teams on every side. Have to use side player(s) in play to score point.